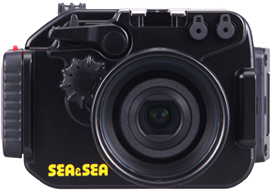 The port is threaded so accessory lenses, including the M67 Wide-angle Conversion Lens 0.6x and the Close-UP Lens 125 (discontinued) with M67-M62 Step Down Ring58122, can be used. * Angle of view increases from 28mm to approximately 17 mm when the M67 Wide-angle Conversion Lens 0.6x is mounted. 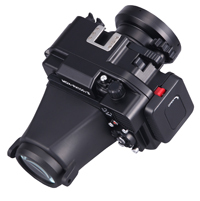 The hood reduces reflections and provides a clear and complete view of the cameras LCD screen. Using the SA8 Fixed Ball Base allows various light mounting options　without needing a tray or stay. The large dial on the housing front connects to the camera’s control ring and smoothly operates Manual Focus and other functions (depending on mode selected). The multipurpose control wheel on the camera’s rear is operated by the multi-point controller on the back of the housing. All controls can easily be reached and operated by your right hand. Optional Leak Sensor can be built into the housing. Its LED lamp is located in the LCD monitor window and alerts you to any water ingress. on the rear) to avoid electrolysis damage. The housing is easily opened and locked with the rotary latch and hinge. similar to the tripod socket on the bottom of the housing.